Home How the Dryers are made? How the WPS Panther Tunnel Dryers are made? We manufacture all of the WPS Panther Dryers in Kent, UK. The frames are fabricated using mild steel and then primed and powder coated. We then take the powder coated frames and start the Dryer assembly process. Then we wire all of the components, make any configuration changes required and then test the dryers for 24 hours prior to despatch. All WPS Panther dryers are fitted with advanced design ceramic heating elements. Ceramic elements radiate most of their heat energy as long wave infrared heat at exactly the same frequency as the “peak absorption frequency” of t-shirt printing inks. The wavelength of heat is true “black heat” which in practical terms means that you cannot see any glow from the elements and the heat itself is not colour sensitive. All of the elements we use are either manufacturer in the UK or Ireland. You use far less energy (electricity) to raise theprinting ink to its correct curing temperature than you would with any other type of heating element. The temperature of the garment does not reach the same temperature as the ink, resulting in less chance of shrinkage of the fabric and less chance of scorching. As the heat is not colour sensitive it heats all colours at the same speed. One setting on the dryer will cure all colours of ink and dark shirts do not overheat and scorch, as they tend to do on medium or short wave length dryers. They have a very long life in use. We know from experience that most of the elements in a Panther Dryer will last more than 20 years. 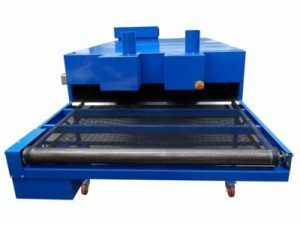 We make dryers with heating element widths of: 24.5cm (10 inches) / 51.5cm (21 inches) / 78.0cm (32 inches) / 104.5cm (43 inches) / 158.5cm (64 inches) Other widths are available in approximately 5 or 10 inch units. 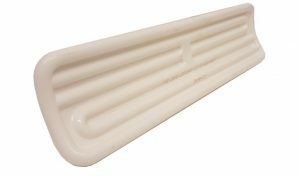 The heating elements are selected to have a surface temperature range of 0 to 500 degrees centigrade. This is the optimum range for garment dryers where the inks require 120 to 170 degrees centigrade. We can install different wattage elements for customers who want to use different temperatures. Element height adjustment is built into all WPS Panther dryers. 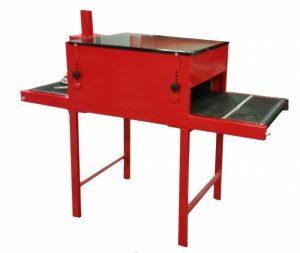 The height of the elements above the conveyor belt is adjustable from 60 to 160 mm. This makes it very easy to pass caps, jackets and overalls through the tunnel. We do also make special order dryers where the elements will adjust up to higher positions. “peak absorption frequency“. If you pass temperature testing strips through a tunnel (with ceramic heating elements) on a printed t-shirt at a temperature suitable for curing a plastisol ink you will probably measure 130C on the temperature strip but the t-shirt will actually reach 145C and the ink will reach 160C. The temperature shown on the temperature strip will only be the temperature of the strip, nothing else. The same principle applies with other devices. The best use for any of these devices is to ensure consistency between print runs rather than trying to establish the exact temperature that you have reached. WPS Panther dryers are fitted with dual display digital temperature controllers. The top display shows the actual heating element temperature in degrees Centigrade in red. The lower display shows the selected temperature in green. The controller will keep the temperature within 2 degrees of the selected temperature. A red indicator light shows when the power switches on and off. The temperature is selected simply be pressing up or down arrow keys. The heating elements on the 8000 series are split into 2 heat zones (front and rear) and each zone has its own controller. It is often an advantage to run the dryer with a hotter zone at the front. This heats the ink up to its drying temperature faster. Optionally the long dryers can have 3 advantage to run the dryer with a hotter zone at the front. This heats the ink up to its drying temperature faster. 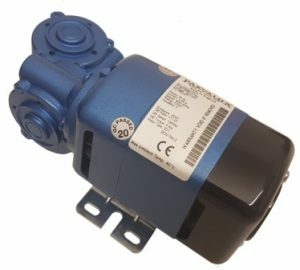 All WPS Panther dryers are fitted with variable speed Parvalux DC motors which are made in the UK. DC motors combine good torque characteristics with reliable variable speed control. A printed circuit board and potentiometer in the control box provide the variable speed. The normal speed range of each type of dryer is shown in the individual specification sheets and covers the range most suitable for drying t-shirts. All WPS Panther dryers have fume extraction ventilators . 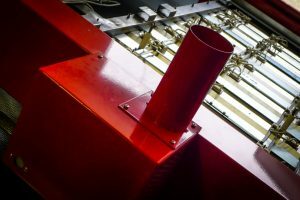 The fumes are exhausted through a 160mm long exhaust stub (connector), which can be connected to ducting so that the fumes can be removed from the workshop. On the 700 series there is one 75mm diameter exhaust stub. On the 8000 series there are 1 or 2 100mm exhaust stubs. The 8000 series also have a ventilator speed controller, this controls the volume of air passing through the tunnel. 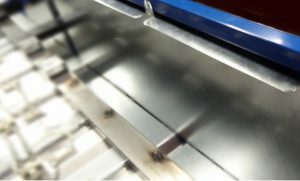 We fit conveyor belts which are about 20cm wider than the heating elements. This allows printers to put larger pieces through the tunnel more easily. 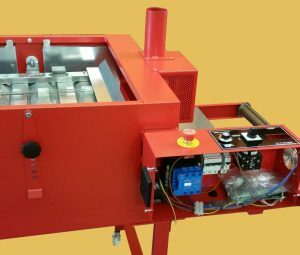 As an option you can order a dryer with any width of conveyor belt. 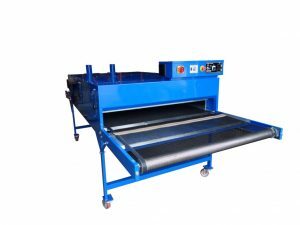 All conveyor dryers are fitted with a black (carbon impregnated) antistatic, open mesh, PTFE coated fibreglass conveyor belt.